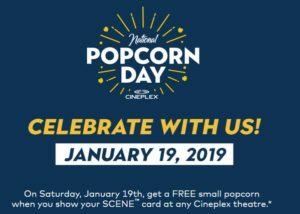 On Saturday, January 19th, get a FREE small popcorn when you show your SCENE™ card at any Cineplex theatre. This is in celebration of National Popcorn Day! The offer is available at all 165 Cineplex® theatres across Canada for every movie and every showtime on Saturday, January 19, 2019. To take part in National Popcorn Day festivities, SCENE® members simply need to scan their membership card or the barcode on the SCENE app at the theatre’s concession to receive a free small bag of Cineplex’s famous popcorn. The offer is valid for one bag per SCENE member and cannot be combined with any other concession offers, combos or promotions.